Sixty-eight years ago, St. Petersburg was known as Leningrad, and counted as one of the Soviet Union’s largest cities. These days, those two names conjure up images of a distant past; an anachronistic, shady corner of European politics and culture. Yet this series of images, posted a while back on Englishrussia, suggest that today’s St. Petersburg still strongly echoes its Leningrad past. 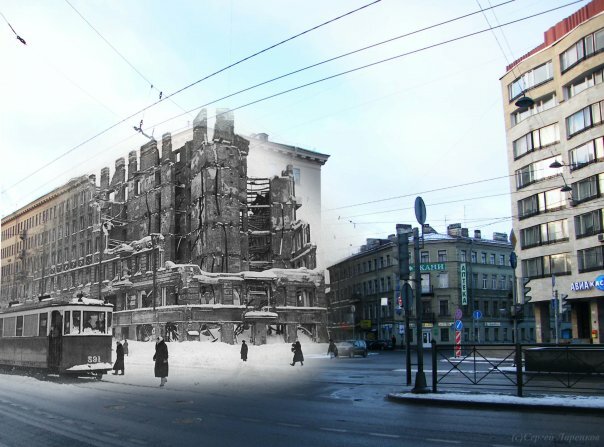 Old has been transposed onto new: photographs taken during the 3-year Nazi siege of the city have been stitched into contemporary pictures of the same sites. The results bring this harrowing time in the city’s history back to life, situating the tragedy of World War II amidst contemporary landmarks. The world has changed in the nearly seven decades since the end of WWII, and these images certainly visualize this transformation. But they also highlight an undercurrent of continuity. The seamless overlay of one era onto another suggests a kind of urban endurance and resilience, in spite of the traumatic events that history may throw its way.